I went on holiday for 3 days and covered some serious ground for the first time in a while. I recorded at least 8000 steps a day - not much for a normal person, but boy that felt good in a boot! I felt really confident for the move to 2 shoes as, with my first ATR, I never managed to walk that much in the boot. 8 weeks and 1 day after my right ATR was my birthday… and check up day. My doctor inspected my Achilles and I was cleared to transition to 2 shoes. My doctor added one heel raise to my running shoes and I can also wear my boots with small heel (without a raise). Last time I had custom raised shoes made, but this approach is much more flexible. With my shoes on I was ready for the first step… And it was awful! Because I had a cast and then a boot on for so long, it felt like my leg was floating and wouldn’t stick to the ground! But, with the help of my crutches, I soon had a walking motion going! I was then instructed to try a calf raise with about 20% of my weight on my right leg. Such a strange feeling! Last time I was instructed to wear 2 shoes inside and my boot outside for a transition period. This time, I’m wearing 2 shoes everywhere - unless there is a good reason to be careful (like needing to get to a meeting fast!). My strengthening programme involves increasing the number of calf raises every second day, until I can do 60 in the morning and 60 in the evening. Then, I’ll work on putting more weight through my right leg. I’ll also add bent leg calf raises to work my soleus. My main focus though is to get plenty of walking into each day. Over the last 3 days my walking has come along in leaps and bounds. My leg feels stronger every day. I’m focusing on walking as normally as possible, so that I do not develop a limp. I no longer need crutches inside, and just take them when I go outside to help with uneven ground, slopes, etc. So far, I think I’m well ahead of where I was 8-9 weeks after my left ATR. I’m also gradually introducing biking into my routine. It’s scary how much fitness you loose with this injury, so it’s great to be able to start come cardio work. Getting to the gym is a real challenge, as I wont be driving for another 4 weeks or so. My Uber bill is sky rocketing. My biggest challenge at the moment is swelling. My ankle area is getting extremely puffy. I have a compression bandage, but it’s not enough. I’m scared to try a compression sock though, as I got stuck in one when recovering from my left ATR! I’m massaging and elevating my foot twice a day to try and manage the swelling. 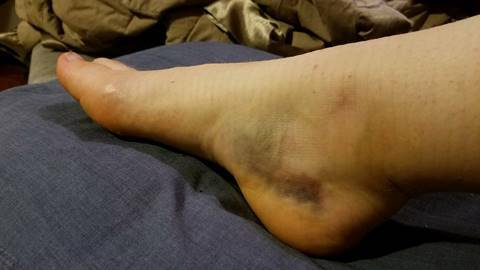 I see my physio in a few days - hopefully she’ll have some ideas to manage the swelling better! I saw my specialist at 5 weeks, and he gave me the ok to start PWB at 6 weeks. As it happened, my right crutch broke at 5.5 weeks so I ended up bringing that forward slightly. (As an aside, if you wear through the rubber on the bottom of your crutch, a washer, some rubber and duct tape will do the trick - took me a couple of goes to find a fix!). I’m 6.5 weeks now and FWB. I still use one crutch usually to ensure I get a good walking motion. I slip into a limp without one crutch to push me through the step slightly. I use two crutches outside (uphill is challenging!) and when I’m tired too. 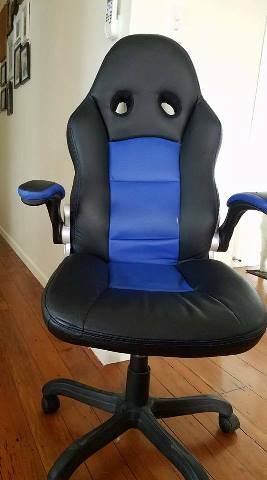 I also bought an “Evenup” for my good leg. I didn’t have one with my last ATR and it definitely makes a big difference. So far, my right ATR feels streets ahead of where my left ATR was at this stage. I’ve got a lot more functionality in my toes (thanks toe exercises), strength in my upper leg, and generally better mental connection to my leg. I think not being scared of my leg has made a big difference this time around. I’m also spending some time with my foot out of the boot each day now, preparing for life after the boot! It sure is nice to get some sunshine on the leg!!! Today, it is 4 weeks since my right ATR (and 14 months and 2 weeks since my left ATR). This stage is very boring – there is very little rehabilitation to do, and normal life remains quite difficult. Still, I know that soon (in just 2 more weeks) life will get interesting again. Under my protocol, I will start partial weight bearing (“PWB”) at 6 weeks. That stage comes with a few perks, such as being able to start stationary biking! An alarm on my phone sounds every two hours – and it’s such a relief to get out of the boot! I spend 5-10 minutes removing my sock, doing my ROM exercises, doing some toe exercises (I put my toes on the ground, then lift my big toe only 10x and then my other toes only 10x), and gently massaging my leg and foot. Always in plantarflexion, of course. I am doing my best to get out and about. 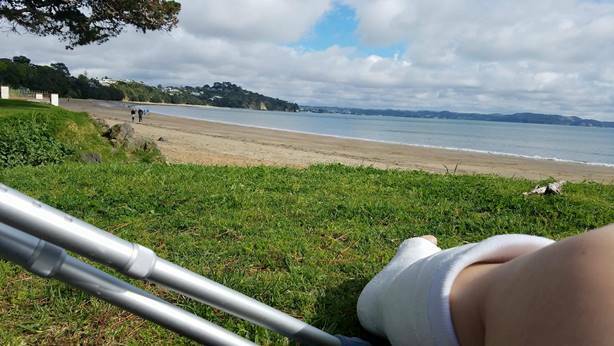 There is plenty you can do outdoors on crutches – I’ve even managed to go for a couple of ‘walks’ at the beach! There is nothing like fresh air! I also managed to get around a museum exhibit with the help of a wheelchair! Home chores are quite difficult at this stage. Particularly if you don’t have home help, I recommend hiring an i-walk. These guys make it possible to tidy and vacuum the house while NWB! I find it quite hard on my knee, so I can only use it in short bursts. I am doing my best to keep as active as possible, and prepare my body for the next stage. Most days, I do a circuit of upper body and core exercises, as well as a range of NWB exercises aimed at maintaining strength in my calf (left), glutes, quadriceps, and hamstrings. I am also keeping a close eye on my posture. I find it is quite easy to let my hip slip out of alignment, which I think contributed to some of the difficulties I had when I started walking after my left ATR. I’m hoping to avoid those delays this time! - 1 week at 30° plantar flexion non-weight bearing in the boot (NWB). Range of motion exercises completed for 5 minutes per hour from this stage. - Partial weight bearing at 6 weeks transitioning to full weight bearing at 8 weeks. Boot can be removed at night from 6 weeks. I followed a similar protocol with my last ATR, with two key differences (1) my doctor didn’t intend to reduce the angle of my foot until week 6 - until I pushed for that to happen, and, (2) last time I had heel raises inserted in the boot, whereas this time I have an adjustable boot - which seems much more precise! If you are in New Zealand, I highly recommend going to a private sports doctor (e.g. Axis Sports Medicine), rather than through the hospitals/accident centres. The protocols vary widely between specialists. When I went to the hospital following my first ATR they told me I would be in a cast for 8 weeks! And the specialist who removed my cast this time put my boot at 20° instead of 30° - luckily that was only overnight. With both of my ATRs, I have had 3-4 days off work on sick leave and returned to work the following Monday. In New Zealand, ACC covers taxis from home to your workplace and to your medical appointments. This makes it much easier to get back to work, as my driving leg will be out of action until about week 10. At work, I have a leg rest (also from ACC) so I can keep my leg raised. I also try and spend some time on the ground - a funny sight in an office - to get my leg above heart level. This injury is very challenging, both physically and mentally. I think I am quite a positive person, but this second ATR is definitely hard. One tool I use to help with that is the Headspace app. The app provides guided meditation and mindfulness programmes on a variety of topics. It has a rehab programme, which helps keep you mentally focused on recovery. 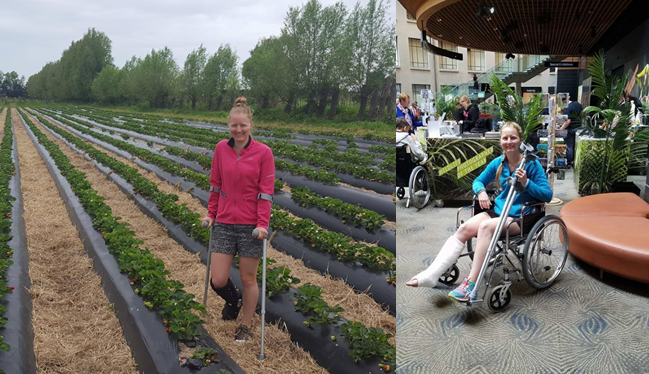 I’ll try anything and everything to get back on two feet as soon as possible! In terms of cardio, I plan to start stationary biking at 6 weeks and swimming/water walking at 8 weeks. But, based on my last ATR, I need to do more to minimise muscle wastage in the interim. Upper body and core exercises can be easily modified to be non-weight bearing (although you need to up your push up count when you are doing them from your knees!). I’ve also been getting in plenty of calf raises on my *good* leg. Last time, I lost a lot of muscle in my glutes and upper legs - so, this week, I will be seeing a personal trainer to set up a programme for me so I can minimise that muscle loss. That should speed up my return to walking, running and netball! I spent most of Week 1 on the couch at home. After my first ATR, I found I was very tired and slept a lot during the first week. This time around, I’ve had more energy but I have forced myself to rest as much as possible. I was able to get out of the house a few times - there is nothing like sitting in the sunshine at the beach to lift the spirits! When I ruptured my left Achilles I had so many questions, but of course my number one question was "Should I be having surgery?". In New Zealand, ATRs are generally treated conservatively. While some hospital-based specialists still recommend using a cast for up to 8 weeks (avoid them! ), most specialists now recommend an early weight bearing conservative protocol. The details of the protocol used in New Zealand are here: https://www.axissportsmedicine.co.nz/patient-information/achilles-tendon-rupture/ . The AchillesBlog website contains plenty of links to studies demonstrating the effectiveness of conservative ATR treatment. As my left Achilles healed well without surgery, I had no concerns about following this protocol again. Surgery is hard on the body and has risks, so why do it if it doesn’t have better results? This time around, my number one question was "Why am I so unlucky?". Again, I turned to the AchillesBlog website. Research suggests that 6% of ATR patients will experience a contralateral ATR (see https://www.researchgate.net/publication/8919074_Contralateral_tendon_rupture_risk_is_increased_in_individuals_with_a_previous_Achilles_tendon_rupture ). Personally, I had previously experienced tendonitis in my right Achilles, so I knew I had some pre-existing degeneration in that leg. I also have a family history of Achilles issues. I returned to a high level of training, whereas I expect a number of ATR patients reduce their level of participation in sport compared to their pre-ATR levels. Finally, in the 4 days before my injury I did an intense leg workout at the gym and ran a 15 km race. All in all, those factors clearly outweighed the rehabilitation work I did on my right leg when recovering from my left ATR. Shower chair - I recommend a stool rather than a chair as its less cramped in the shower. 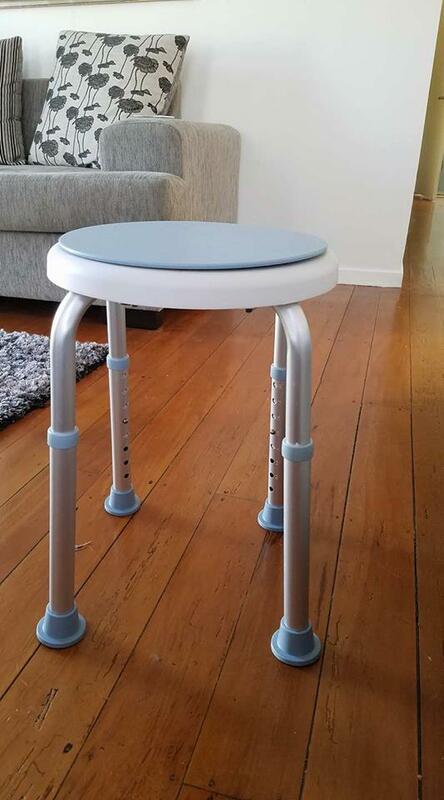 This shower stool was $40 - ordered online and delivered in one day. 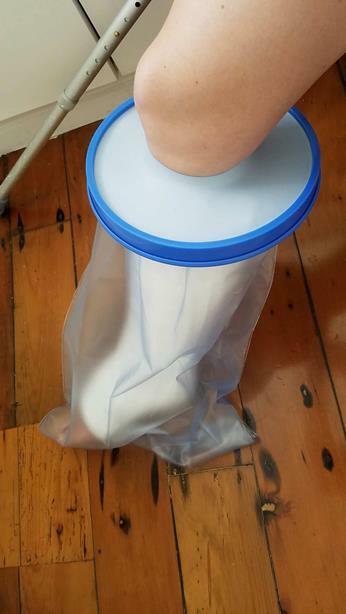 Shower cover - I used a simple bin bag and duct tape after my first ATR. This time, I invested in a reuseable cast cover - it certainly makes showering easier and is nicer on my skin! Chair with wheels - you can get all sorts of equipment (through ACC in New Zealand), however the humble office chair is very useful - at least initially - as most people have one available. I use it for cooking, washing dishes and carrying items between rooms. For both ATRs, I have chosen to increase my intake of fruit and vegetables, and remove all processed foods, alcohol and caffeine from my diet. I have also chosen to use painkillers minimally, as there is some (mixed) evidence that they inhibit recovery. With my left ATR, I chose to take a multi-vitamin and have a protein shakes daily. 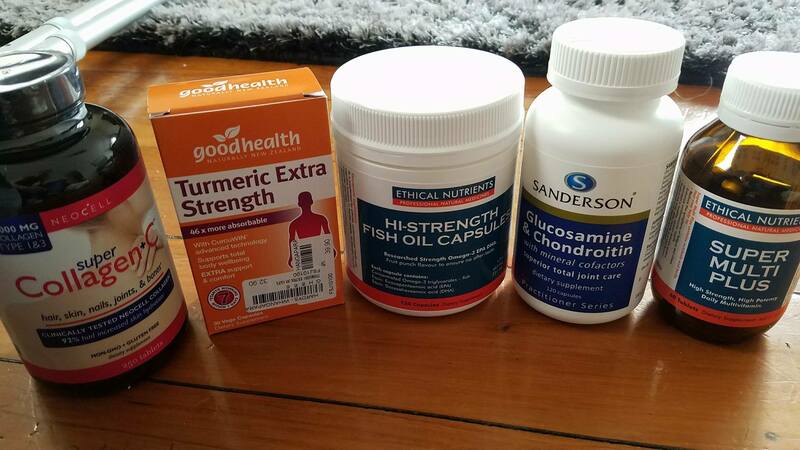 With my right ATR, I have chosen to add collagen, turmeric, fish oil, and glucosamine/chondroitin supplements. (Of course, there is mixed evidence of the value of supplements, so do your own research). I ruptured my left achilles tendon playing netball on 9 August 2016. I was treated conservatively, which is the normal course of action here in New Zealand. I put a lot of work into my rehab and made it back onto the netball court in April 2017! On 25 September 2017, I was playing Fast 5 netball and felt another *kick* - this time in the back of my right leg. I was so frustrated I balled my eyes out - right there on court! Soon enough, the squeeze test and an ultrasound confirmed what I already knew. I was back in a cast. On the plus side, I am a much more skilled operator of crutches this time around! Last time, this website and in particular AgnesATR’s blog was so helpful. Now, I feel like I have some knowledge to share.